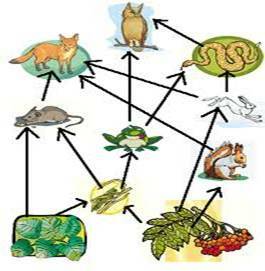 Food web is an ecological network. They look like a concept map. From such a map we understand the pathways energy flows in an ecological community. Solar energy being used by plants for the production of food by photosynthesis is the initial step of this process. Once the plants grow for a while they accumulate carbohydrates. When herbivorous animals feed on plants, this will pass onto their body. 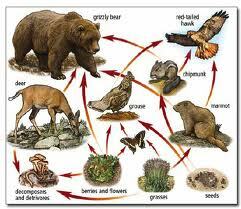 Each and every line of food web explains the relations between organisms in the life of web. Food web is a graphical description of feeding relationships among species in an ecological community, that is, of who eats whom. 1. The Grazing Web - beginning with autotrophs. 2. The Detrital Web - beginning with organic debris. • Plant and animal matter is broken down by decomposers and then pass on to detritivores and then to carnivores in the detrital web. The species composition is normally illustrated in the food web. We can understand the changes in a single species. The species is directly and indirectly influence many others. Each organism depends on others. Food webs are generally restricted to a specific habitat so they are limited: for example, the food webs in the cave or a pond. The aquatic food web demonstrates the complexity connecting the aquatic system to the nearby land. To understand the movement of nutrients from the producers to top predators, the food chain is used to measure the number of species involved in the process. It helps to simplify the food web. 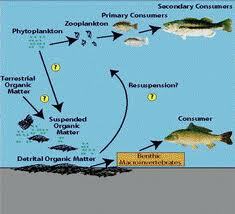 Every known food chain starts from the autotrophs only. 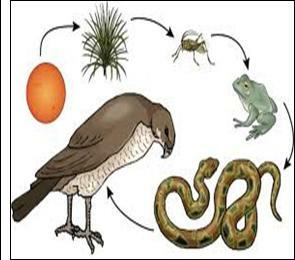 Al-Jahiz demonstrated the food web and gave definition to it. It was the first research on food webs. The earliest graphical representation of a food web was given to us by Lorenzo Camerano in 1880. Interest in food webs increased later and many scientists involved in the research process of food webs. They came to a conclusion that the complex food webs should be highly unstable. Food webs serve as a framework to help ecologists organize the complex network of interactions among species observed in nature. Want to know more about the food webs? Click here to schedule live online session with e Tutor!